Tag Size: 3/4" High x 2 1/4" Long and .050" Thick Anodized Aluminum. Price includes your personalized text or wording on FRONT side, up to 4 lines. Allow 3-5 Days Production Time..
Tag Type: .050 in. Thick Anodized Aluminum. You may add multiple wording and/or options of this item to reach quantity discount, cart will recalculate the price automatically. Contact Us for larger quantities. Our Long Rectangle aluminum key tags are perfect for permanent identification of keys, valves, cases and more. Engraving on the front side is INCLUDED in the price, Engraving on the back is available at an added cost. Maximum 4 Lines and 30 characters per line. Text will be centered to best fit on the tag, unless you specify otherwise in the 'special instructions'. Tags are 2 1/4" Long x 3/4" Wide and .050" thick. The keyring hole is .150" in diameter. Available in Blue, Red, Black, Green, or Purple. Enter text, including punctuation and spaces exactly as you would like it to appear on each line. We can put as many letters as you'd like on a line, but the more letters you use, the smaller the text must be. You do not need to use all lines, the fewer lines, the bigger the text will be. Note in the special instructions box that additional engraving info. is going to be emailed.. Choose font, text orientation, and any other options. Be sure to click the "YES, The information I have entered is correct" checkbox at the bottom before adding to cart. Max. 30 Characters per line..
Engrave Text on Back - Not Required, Additional Charge. Select ... Best Fit - Let our expert engravers decide what looks and fits best on item. All Lines SAME Height - All lines will be same height and fill item. First Line Larger - First line of text will be bigger than all others. Other, Please enter special instructions (font size, layout, etc.) in the box below. Please ensure you have entered all customization information correctly. You may add multiple wording and/or options of this item to reach quantity discount, cart will recalculate the price automatically on total quantity. Call us for custom sizes, shapes, colors or anything else you need in key tags - we can produce almost any size and shape you desire. 2 1/2" x 3/4" Anodized Aluminum Keytags Can Be Stamped Or Engraved Available in 5 Colors. 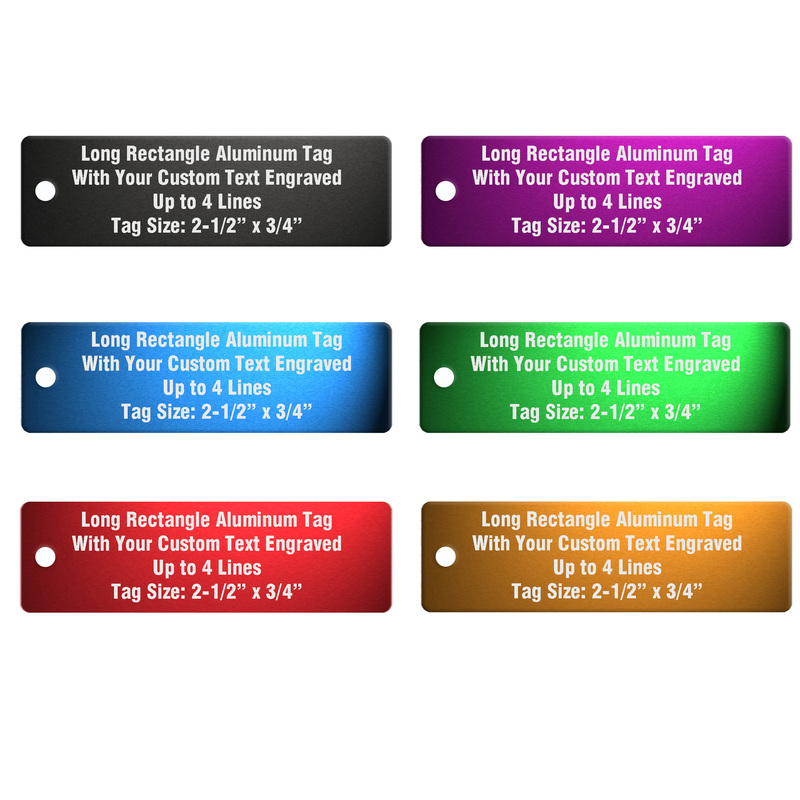 Tag Size: 1 1/4" Diameter Anodized Aluminum, Color on BOTH sides. Minimum 10 or more with ALL IDENTICAL wording and/or sequential numbers. Tag Size: 3/4" High x 2 1/4" Wide and .050" Thick Anodized Aluminum. Price includes your personalized text or wording on FRONT side, up to 4 lines.